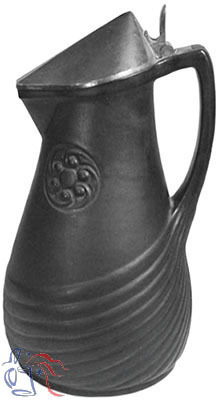 “Lava-Steinzeug” (lava stoneware), an available glaze option on this piece, was the name applied by Gerz to wares finished with the matte black glaze shown here, found on only a limited number of Art Nouveau (Jugendstil) designs. Note also the unusual pewter arrangement, with the thumblift shank embedded into the top of the handle. This too was a short-lived innovation that appears to have been used on just a handful of Gerz Jugendstil steins.